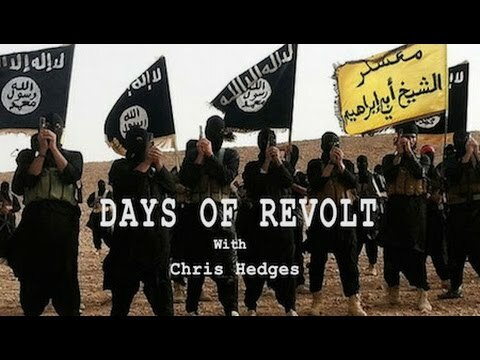 In this episode of teleSUR's Days of Revolt, Chris Hedges and Sabah Alnasseri discuss how US foreign policy and class struggle created the conditions for the rise of ISIS, and compare ISIS's colonialist strategies to those of the Israeli independence movement in Palestine. We’re filming this segment in Toronto with Professor Sabah Alnasseri, who edited Arab Revolutions and Beyond. He’s a professor at York University teaching Middle East politics and is a native of Basra, Iraq. We’re going to do this in two segments. The first one will be focused on the rise of the Islamic State, known as ISIS, and the second will be on the Arab Spring and Arab revolutions, putting them in a historical context and trying to grasp what’s going to be or what’s going to come next within the Middle East. SABAH ALNASSERI: Thanks, Chris, for having me. HEDGES: So let’s begin with ISIS, which is historically an extremely important movement within the Middle East. The 1916 Sykes-Picot Agreement, which is named for the French and British diplomats that carved up the Middle East among the colonial–among the empire, essentially turning countries in the Middle East into protectorates, has only been changed twice. The first time was the Israeli independence movement, which rose up in Palestine, and now with ISIS, which controls an area roughly the size of Texas. The mechanisms that were used to redraw the map in the Middle East are the same: the use of foreign money, the use of foreign fighters, the tactics of ethnic cleansing and terrorism, and this mythical vision, in the case of Israel, the re-creation of Judea and Samaria from the Bible, the land of Israel, and in the case of ISIS, the re-creation of the seventh century caliphate. And these tactics have could prove quite effective. In both cases, in the case of Israel and in the case of ISIS, you could argue, especially with ISIS having roughly 20,000 foreign fighters, that these are forces that are as dependent on the areas outside the Middle East as within the Middle East. And I wondered if you could kind of address that phenomenon, this phenomenon that we are watching. ALNASSERI: Right. Right. I mean, you are right, because ISIS has a kind of settler colonialist form the way they occupy space, cleanse the space, plunder the resources. HEDGES: Which is what–as Israel does. ALNASSERI: Exactly, and carve out territory for itself. But to understand the phenomenon of ISIS, we needed to contextualize it within the setbacks and counterrevolution against the Arab revolutions, the amount of violence, of intervention, in Libya, for instance, the war in Libya, the civil war in Syria, now the war also in Yemen, and–. HEDGES: And Egypt. We can’t forget Egypt. ALNASSERI: Exactly. We don’t forget Egypt. And the failure of this peaceful, nonviolent revolutions, this amount of violence, of counterrevolutionary violence, created this Frankenstein, this phenomenon. So you can say ISIS is a Hegelian-Fischer synthesis of two form of violence. HEDGES: And we have to go back to Egypt, because with the rise of Morsi and the Muslim Brotherhood, there was this debate between the Brotherhood which said no, we can take power through elections through nonviolent means, and the so-called Salafis in Egypt, who actually were convinced by the Brotherhood–I think there were roughly 60 Salafis; I can’t remember the exact number–within the parliament. And then, with the overthrow of Morsi–and the thing about Morsi, with all of the mistakes that Morsi made in terms of turning on the secular opposition, is that he worked overtime to try and placate the military. And in countries like Iraq or Egypt, the military is not just a military force but an economic force. They control whole segments of the economy, including military industries. And it failed. The military, certainly with the support of probably Washington and Israel–certainly with the support of Israel–. And that sent a message not only to the Salafis or the jihadists in Egypt, but throughout the Middle East. ALNASSERI: Right. But it’s interesting to see that this message can take different forms. The first one, you can see a positive form if you look at Ennahda in Tunisia, who actually won the election and the presidency and so on until recently, last year. But what happens in Egypt with the Muslim Brotherhood, the Ennahda took a different directions. They basically rolled back and opened up much more space to the Ennahda Tunis, which is a much more left liberal platform, who won the election and the presidency, because they realized if they pursue such a confrontational cause, they might be oppressed and annihilated. So it took a positive form, whereas in Iraq and Syria, due to the context, a different context, we have ISIS. So what I was saying is the first type of violence was the physical military intervention of violence. The second one is the systemic corruption, the expropriation and dispossession of the majority of the people of their resources, public resources. And this is very clear in Iraq. The way the United States institutionalized the political system and all these formula of muhasasa, you know, power-sharing formula, it actually debriefed all the Iraqi people from the access to the public resources they used to have. HEDGES: And I think we should just interject here by saying that before the war, Iraq had a very vibrant middle class. HEDGES: I remember visiting Iraqi hospitals, which I think were built by the Swedes. I mean, they were modern hospitals. Yes, Saddam Hussein ran an extremely repressive and horrific regime, but economically Iraq shared in the oil wealth of the country, the average Iraqi. HEDGES: The Ba’ath Party was the ruling party, we should say, in Iraq. ALNASSERI: Exactly. It’s not only [incompr.] violence. That’s true, too, but I think the biggest chunk of the legitimacy of the Ba’ath Party was based on the redistribution of the oil income in forms of free public health care, education, pensions, and so on. HEDGES: Right. Very fine educational system. Yeah. ALNASSERI: So even the majority of the Shiites and the Kurds, right, who hated Saddam as in Ba’athist, benefited from this redistribution of the income. Now, with the privatization of Bremer, who Iraqi people calls the “Caliph of Baghdad” in two thousand–. HEDGES: Bremer was the American–. ALNASSERI: Exactly. In May 2003, the privatization and the institutionalization of the U.S. strategy of shock and awe, which is state-sponsored terror, on the one hand, and cash, corruption, using money to buy and corrupt some forces in Iraq, it was institutionalized. So the outcome of this: you have one of the most corrupt states on the face of this earth. So the majority of the people in the Middle East, the absolute majority–up to 65 percent under 24 in Iraq–45 percent of the young people are under 14. So it’s the youngest population probably on a worldwide scale. Now, what do they see? They see at the top of the state a systemic corruption, you know, the systematic plundering of the resources of the country, and they transfer all these resources to outside the country. There’s no health care, no education, no jobs, no pension, no nothing. On the other hand, they see ISIS. Okay. They pay you $500 a month and they share with you any resources they plunder, be it oil or gas or taxes. They dispute this among their followers. Now, if you are a young Iraqi, Syrian, Libyan, etc., you see peaceful revolution failed because there was an immense external and internal intervention in a violent way. The state is corrupt. But then there’s much effective–. HEDGES: –in the sense that it feeds a Shiite elite at the expense of the Sunni majority. ALNASSERI: Exactly, and sectarian in the sense–not in a religious sense, but in a class sense. So you have the majority of the people, the young people in Iraq, have no jobs, no education, no health care, no prospects whatsoever. They are arrested, incarcerated for no reasons. There were so many protests the last few years for basic services, for electricity, water–. HEDGES: And we should say nonviolent mass protests. ALNASSERI: Nonviolent. And they were faced by these militias of different parties in power. And a lot of people were massacred in Basra, in Baghdad, etc. So then, on the other hand, they see an effective form of organization like ISIS. They can earn money, they can share the resources, and they can push back against this class-based sectarian politics within the country. So you have these young people looking at ISIS. They earn $500 a month. HEDGES: These are the fighters. ALNASSERI: The fighters. And if they occupy a territory, if there’s oil, gas, whatever resources they take, they redistribute the resources among their followers and they collect taxes. HEDGES: And they’re very good against corruption. ALNASSERI: And they’re good against corruption. And they bring services, basic service to the people. In Mosul now you have electricity, but not Baghdad and Basra. Why is this the case? Because most of the–at least the leadership of ISIS, most of them used to be Iraqi bureaucrats and officers and generals, people who have enormous institutional experience. They know how to run things compared to the current corrupt political class in Iraq. So they know how to deal with this everyday life. They know how to bring services to the people. So these are the options the young people have: one, a corrupt political system; on the other hand, an effective, violent, but a much more socially and ideologically appealing organization than the corrupt political system. HEDGES: And there’s two important points about ISIS. The first is that much of the territory that ISIS controlled was in chaos. And people forget that there were competing warlords, and people were being kidnapped for money, and so civil society completely broken down, courtesy of the American occupation. And for whatever terror ISIS carries out–and it certainly does carry out horrific terror–it has brought, as you point out, a semblance of, if not normalcy, at least order. That’s the first attraction. The second is that, as you have also pointed out, the deep disappointment, especially among the young, in the failure of the Arab Spring, the failure of these nonviolent movements, has made them ask the question–which is a question that people in the Middle East have been asking since the end of World War I–how are we going to build an authentic liberation movement? This is what was the impetus of Nasser in Egypt and, of course, the Ba’athists, who are are really just a mirror, in essence, of the Nasserites. And these secular regimes soon became corrupted, and not only became corrupted, but eventually became tools of imperial power once again, Hosni Mubarak being a kind of classic example of that. And so the ability of ISIS to bring order and to actually function as a liberation movement, you see that when they tear down the border post between Syria and Iraq. They were right. This is the end of Sykes-Picot, the 1916 agreement that the imperial powers used to redraw the map of the Middle East. And that is true. HEDGES: And let’s not leave out–you know, let me–that’s a very important point, because remember when they captured the Jordanian pilot and they burned the Jordanian pilot in a cage, which was barbaric and horrible? But why? Because American planes were incinerating whole families inside their houses. And so what they did was a cruder version, but morally it was the same. And that’s what we on the outside don’t see. ALNASSERI: Right. Like, for instance, think about Yemen. Since years they’re using drone, you know, massacring families and so on. So we don’t see this state-sponsored terror. We see only the so-called private, civil terror. And I want to avoid this simplistic worldview. And that’s why I was arguing years ago in understanding Iraq that terror in the context of this imperialist democracy war of intervention is nothing but a form of governance which ISIS–. Source media: Cam1_0009_01_AudioFIX.wav (10:42.560). Server: WeTransfer.com. ALNASSERI: So, as we said, terror is a form of governance ever since the U.S. occupied Iraq. So ISIS represent and embodied this form of governance. The second point, and I think this is very important: what enabled ISIS to become as such, as Islamic caliphate, is the peaceful protests in Ramadi, in Falluja, in the western provinces of Iraq in 2013 for almost–. ALNASSERI: Against corruption, against exclusion–. You know, Chris, as you know, social exclusion is not only violent; it produces more violence. So people protested for almost for one year peacefully. They were camping, occupying the space, just like Occupy. So what the minister president at that time, al-Maliki, did: he used–for the first time probably in the history of Iraq, he used the army against the civilian and massacred many of them in Ramadi, in Falluja, and in Mosul. There were also other peaceful protest at this stage, in December 2013, where you have fighters of Islamic State entering the western provinces of Iraq. And then within a few months they occupied Mosul after that. So it’s very important to remember, the western and northwestern provinces of Iraq, which I don’t call the Sunni provinces, they–nomadic formation. I come from a nomadic family. My father was a nomad. So, historically they are the one who actually secure the border of Iraq. Any government, whether it was the monarchy or the republican under Qasim or the Ba’athists, they rely on the nomads to control the western and northwestern territories and borders of Iraq. HEDGES: That’s also true in Egypt, by the way. ALNASSERI: They are–they know the territory perfectly. But when al-Maliki attacked these peaceful protesters, all the tribes there, they did not resist the Islamic State fighter. They just let them in. Not that they support them, but they enable them by not resisting them, because Iraq, as you know, historically speaking, doesn’t have this form of extremism, especially in Islamic sense. It’s mostly liberal understanding of Islam. So what enabled ISIS to become as such today was the failure of the Iraqi government, and of the U.S. government by betting on al-Maliki all the time until we have these disasters. And I think this is very important to understand. This just didn’t fall like manna from heaven. It has a real material context. ALNASSERI: Absolutely, militias and so on. Absolutely. HEDGES: –out of the Ministry of Interior. HEDGES: Let’s talk about the occupation. I mean, I would argue that from the point of American history it is probably the most disastrous strategic decision America has ever made. HEDGES: And it has, of course, destroyed Iraq as a unified country, which I don’t think it’s going to come back as a unified country. HEDGES: It has upset the balance of power between Iran and Iraq. HEDGES: And it has spawned extremist jihadism, which, as you correctly point out, is a reflection of the state terrorism and violence. One million Iraqis–we’re responsible for the death of 1 million Iraqis. Three to four million refugees. HEDGES: The physical destruction of Iraq, as we spoke about before. HEDGES: It had an advanced infrastructure, a thriving middle class, a well-educated population. All of that we wiped out. HEDGES: What are the consequences now within Iraq and the Middle East of what we as Americans have done? ALNASSERI: I think an important issue here is the civil war in Syria and the militarization of the revolution in Syria. It started, as you know, peacefully. But then you have the regional power, but international power, supporting different factions in Syria against al-Assad. And the weird thing about it: it’s sometimes–I argued once on The Real News that when war, the war of terror, become endemic, justification are contingent. So you have the same regional and international power supporting one force in Syria and fighting it in Iraq and vice versa. And that what complicated things. So if the conflict in Syria is not resolved peacefully and politically and if the constellation of forces in Iraq are not shifted in a radical sense, that the majority of the people feel included politically, economically, territorially, there is no way you can deal with the Islamic State, or other jihadist group for that matter. The good news is I was following the latest wave of protest in Iraq and Lebanon, Beirut. Mostly young people–they don’t belong to any parties; grassroots organization–start protesting since weeks against lack of services–electricities and water and clean water, etc. But now they realize once you start protesting against these basic services and you are confronted with the state power, things are transformed. Now people are asking for regime change, because they realized basic services organically linked to the constellation of forces that control the state apparatus and institutions. So there’s no way you can get electricity where you have 50 degrees C if you have corrupt political system. So all of a sudden you have all these young people across the country. And the good news is, especially these so-called Shiite provinces of Iraq, the majority of the young Shiite populations, they are joining other Iraqis, be them Sunni or Kurds are Muslims, regardless, because they realize, all of them, regardless of their religion, ethnicity, are faced with the same problems. And I think that’s good news. HEDGES: There’s one difference between the Israeli state and the Islamic State, and that is that the Israeli state was able to survive because of primarily American but outside military and financial support. The Islamic State does not have that. ALNASSERI: That. And the other thing, the context. Israel was created in a bipolar world order. And for both at that time, for the U.S. and for Stalin, they thought–Stalin thought, it’s a socialist state against all these primitive Arabs, etc. And the U.S., of course, supported Israel against the influence of the Soviet Union, etc. So the world historical context of Israel is not there. We are in the mid of a world disorder, or what I have termed a war order. War became endemic. And I think that’s the only way for the ruling classes in Europe and the United States and regionally to process the crisis. HEDGES: I would just close by saying, which most people don’t know, is that the creation of the state of Israel in 1948 justified the militarists throughout the Arab world, so that in countries like Syria, for instance, or Lebanon we had strong democratic movements. But with the rise of Israel as an agitant within the Middle East, it transformed the Middle East into this antagonistic war–antagonistic war parties. And that is what destroyed democracy and the nascent, and in some cases strong, in the case of Lebanon, democratic forces that were the most hopeful signs within the Middle East. ALNASSERI: Yes. And as I said, I mean, I’m pretty happy about what I observed the last few weeks, what’s going on, again, in the Middle East: peaceful nonviolent protests, grassroots protest, beyond the sectarian, religious, whatever artificial construction of the body politics. And that’s something which give me a lot of hopes. HEDGES: Thank you very much. ALNASSERI: Thanks, Chris, for having me.